A coffin bone can founder if enough hoof wall gets detached, as in the case of onicomycosis, without previous laminar disease. All lose wall should mercilessly be debrided, as Myron McLane taught me many years ago. You then try to support the foot till the hoof wall grows back. Accelerate hoof growth with a good supplement in the diet. Keep the horse at rest, till the sound hoof wall attachment reaches below the distal margin of the coffin bone. If there has not been too much bone loss, prognosis is good, much better than in founder due to laminitis. 01 Lame horse, worried owner. 02 Outside aspect of the foundered hoof. 03a RX, right fore with the shoe. 03b RX, right fore ,without the shoe. 03c RX of the sound left fore. 04-05-06-07 Removing the detached wall, all the way to the sound upper border of the defect. 08-09 Shoes with palmar support, note the seating at the toe of the RF shoe. 10 Left shoe with luwex premium rehe. 11 Right shoe with premium rehe in the palmar area and soft luwex air ride in the toe region as protection. 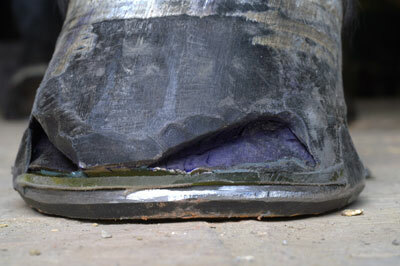 11a-12-13 Right front shod, note the welded-on clip behind the defect on the lateral side. 15-16 Outside aspect on arrival, before shoeing. 17 XR without the shoe, note the well attached upper wall, but also the bone loss. 21 XR control, good hoof wall attachment, good sole depth, bone loss has stopped (but is of course irreversible). Back to light training.